a) It will be pretty good since it is directed by Michael Gondry who directed Eternal Sunshine of the Spotless Mind, which pretty much required a genius to make. b) It spoof's other movies. Like Scary Movie or Epic Movie or Disaster Movie (isn't that title right?) or any other movie whose title ends with 'Movie' and has celebrities like Kim Kardashian and Carmen Electra trying their hand at acting. Please, ladies, put it away. The movie comes across as a bit of both--it is genius thanks to the weird mind of Michael Gondry, but the spoof's aren't so bad and at least most of the cast can act. So, it won't go down in history as the greatest comedy ever made but it spends its time wisely. 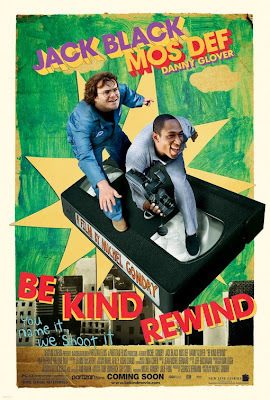 Jerry Gerber (Jack Black) has just become magnetized and unintentionally erases all the tapes in his friend Mike's (Mos Def) video store. They face a problem, but fix it by setting out to remake all of the tapes, using low budget techniques and the public to help them. Their videos become even more popular than the original, and the demand for them gets higher and higher, which makes the pair local celebrities. It's a pretty fun movie to watch, mainly because of the way they remake the movies. And at least the way they spoof the movies is actually intelligent unlike those 'Movies.' However, some of the humour in this movie is extremely dry and sometimes even painful to watch, and there is also surprisingly a lack of humour in this movie. If anything, the only genuinely funny bits of this movie are the remakes of the other movies. To be perfectly honest, this movie is worth watching for the remakes alone. Otherwise, save it for a rainy day.